Research currently suggests that Giulio San Pietro de’ Negri was a younger, independently wealthy son of a patrician Genoese family, probably born between after 1550 and as late as the 1570s. Like other nobility who subscribed to the extremely influential precepts of Castiglione’s book The Courtier, de’ Negri liked to maintain the fiction he had no real interest in his music; it was a frivolous pastime, otherwise he’d be suspected of being a professional musician. Consequently, at least a couple of his surviving collections were gathered and published during his lifetime by a friend, the Genoese poet Marcellino Senarega, to distance de’ Negri both from any evidence of pride in his works and the dirt of common trade. Yet his music gives the lie to this manifested casual attitude. De’ Negri clearly poured a lot of effort into his scherzi and conzonette, and their dedications to a range of highly placed people showed just how much he valued his own efforts. He was in the musical vanguard of the Italian States at that time, mixing folk-like, strophic, monodic pieces that sometimes featured non-functional harmonies (such as Movea deloce un Zeffiretto) with others that are more akin to Jacopo Peri’s highly chromatic, heightened recitative on subjects of emotional pain (Ah, troppo sei crudele). De’ Negri was also skilled at counterpoint, though he used it as one who cared only for seconda pratica. His Ah, troppo sei crudele skillfilly overlays across four voices dissonances in a descending motif, that gain in density and frequency as the work progresses. This collection of 16 works by De’ Negri is augmented by five pieces composed by other musicians active in Genoa around the same time. 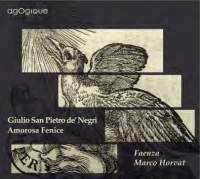 Francesco Rognoni stands out by virtue of a conservatism that looks back at least a century in his melismatic Pulchra es, while Ottavio Valera, a bass noted at the time for his extremely broad vocal tessitura, writes an aria that moves from his native bass well into the tenor range. Giovanni Ghizzolo, by contrast, is represented by a simple strophic song, and a dramatic piece reminiscent of Giulio Caccini. Faenza is a nine-person ensemble consisting of four vocalists (SATB) and five instrumentalists. It encompasses percussion, plucked strings, recorders, and bass viol. The instrumentalists are good, technically proficient and capable of improvising divisions within the style of the times, but the singers are more of a mixed lot. Soprano Olga Pitrarch is excellent, demonstrating good agility and a pleasantly veiled lyric tone, but mezzo Brigitte Vinson has some unsupported notes in the upper reaches of her voice, and in a few numbers lands slightly flat on pitches before immediately correcting herself. Jeffrey Thompson is a good tenor with, again, fine agility, who emotes occasionally by pushing his tone off its focused center. Bass Emmanuel Vistorky has an attractive fast vibrato and superb agility, as Valera’s Sfogava con le stelle shows, though his falsetto substitute for the occasional tenor phrase doesn’t come off well. Ironically, the pieces where any two or more of the group sing together find them all on best behavior, and capable of producing a rounded, vibrant sound. All four enunciate clearly, and Marco Horvat gives them all the dramatic space they need to project their texts’ extravagant emotions. With excellent music, fine engineering, and good performances, this is a welcome addition to the recorded repertoire of early monodic Italian songs.